What's Going On In North Korea? Changes at the top in Pyongyang? Disney characters on display? 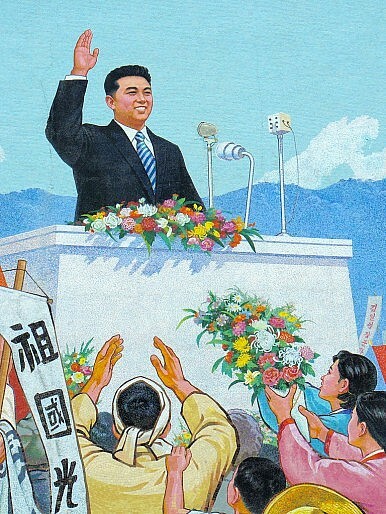 Is Kim Jong-un tightening his grip on power? Kosuke Takahashi reports. When it comes to the wrangling of elites inside Pyongyang, one has to wonder whether a power struggle or policy change is under way in the Hermit Kingdom. In a surprise move, North Korea’s top military officer, Vice Marshal Ri Yong-ho, 69, was abruptly removed from all his posts of the ruling Workers’ Party of Korea (WPK) due to illness, the state-run Korean Central News Agency (KCNA) announced on July 16. Pyongyang also announced on July 17 that it has promoted Gen. Hyon Yong-chol, little known outside North Korea, to vice marshal of the military, raising expectations Hyon will replace Ri both as vice marshal and as chief of the General Staff of the Korean People’s Army (KPA). This sudden reshuffle is sparking speculation over new North Korean leader Kim Jong-un’s internal purge of the old guard, such as Ri, cherished by his father, the late Kim Jong-il. This top-level shakeup also suggests the young leader Kim Jong-un and his closest aides only allow Songun (military-first) politics to operate within a framework that ensures the party’s superiority over the military, ousting old hardline military officers like Ri. But when it comes to North Korea, it’s always important to distinguish fact from unconfirmed information. First, there has been no sign of an unusual state in North Korea’s 1.2 million-strong army, reducing speculation of a possible coup. Second, some Western media cited Ri as “North Korean military chief.” Not quite true. Unlike Western militaries, the No. 1 post of North Korea’s military is not the chief of the General Staff of the KPA but the director of the General Political Bureau of the KPA. As evidence of this, Ri ranks fifth in the party hierarchy, while Choe Ryong-hae, the current director of the General Political Bureau of the KPA, ranks fourth, according to North Korea’s official periodically released accounts. “It is very unusual to hold for the Politburo to convene on a Sunday and announce its decision to dismiss Ri abruptly the following day,” says Takesada, a former executive director of the National Institute for Defense Studies in Tokyo, the Japanese Ministry of Defense’s think-tank. It was also notable that, when referring to Ri, North Korea didn’t use an honorific such as “Comrade” in its official announcement. This may suggest that a power shift or a struggle is still under way in Pyongyang. Ri played a key role in helping the young heir to establish a powerbase among the military, whose support is key to regime stability. As a career military man, Ri assumed the post of chief of general staff of the KPA in February 2009. He was then appointed vice chairman of the party’s Central Military Commission in September 2010, when Kim Jong-un established his status as successor to his father. Ri was one of eight officials who escorted the hearse carrying Kim Jong-il during his funeral in December 2011. Takesada also notes that Ri, known as a hardliner, was the mastermind behind the sinking of South Korea’s naval vessel in March 2010 and the North Korean bombardment of Yeonpyeong Island in November 2010. Yet Ri’s influence has declined over the past few months, as his rival Choe Ryong-hae, 62, has strengthened his own, first by becoming director of the General Political Bureau of the KPA in April and earning the same title as Ri’s, as vice marshal. On April 15, Choe, not Ri, stood beside Kim Jong-un at the high podium during a military parade to celebrate the centenary of the birth of North Korea’s founder Kim Il-sung, in Pyongyang. This scene signaled that Choe had effectively robbed Ri of his position as top aide to Kim Jong-un. Choe is a son of Choe Hyon, a former minister of the People’s Armed Forces and close comrade of Kim Il-sung during his days as a partisan fighter. Choe Ryong-hae in April became a member of the decision-making Politburo Presidium of the WPK as well as vice chairman of the party’s Central Military Commission. The rise of Choe Ryong-hae, despite his previous civilian status in the Workers’ Party, coincides with Kim Jong-un’s ascension to power, meaning Choe is Kim Jong-un’s strong favorite and top aide. Choe is also known to be close to Kim Junior’s Uncle Jang Song-taek. Experts such as Takesada believe that Jang Song-taek, Vice Chairman of the National Defense Commission, and his wife Kim Kyong-hui, former leader Kim Jong-il’s younger sister and a secretary of the party’s Central Committee and Choe are strongly supporting Kim Jong-un as guardians. South Korea’s Yonhap News points out that Kim Yong-chol, chief of the Reconnaissance General Bureau, or the North’s premier intelligence agency, who also played a leading role in the sinking of the corvette Cheonan with Ri, may feel threatened and maneuver against the current regime in some form. Lee Young-hwa, an economics professor at Kansai University in Osaka and expert on Korea, points out that a new economic reform policy called the “June 28 Policy” has created a conflict between the interests of a new military group led by Ri Yong-ho and those of the old military group led by O Kuk-ryol, thus triggering the current power struggle. Kosuke Takahashi is a Tokyo-based journalist. His work has appeared in the Asahi Shimbun, Bloomberg, Asia Times and Jane’s Defence Weekly, among other publications. You can follow him on Twitter @TakahashiKosuke. Engagement does not have a good track record at producing breakthroughs with Pyongyang.